For more information about Beco Pets, the latest media releases, to arrange interviews, and for a selection of free photos and videos, please contact Alec Lom, Beco Pets Media & PR Director. Congratulations to Your Cat magazine advent calendar winners! The team at Beco Pets is asking for your help – and if you can help us, we’d be so grateful! We’ve just had some fantastic news: we’ve been shortlisted for Europe’s top business award – and we’d really like your vote so we can win through to the finals. Voting takes less than ONE minute. Just click the link below and enter your email. (There’s also a 2-minute fun film we made about Beco to hopefully impress the judges at the European Business Awards). Wish us luck! Please pass this request on to all your friends! Trans-Atlantic Partnership boosts $60BN U.S. The trading partnership between America and Great Britain is being boosted by a new ‘Green’ alliance spanning the Atlantic and targeting the US pet trade. The alliance has been forged in Chicago and London, where top UK pet firm ‘Beco Pets’, Great Britain’s biggest manufacturer of eco-friendly pet products, has launched a major sales and distribution deal. Beco (the ‘B’ stands for ‘British’, and the ‘-eco’ signals its ecologically-friendly approach to business), is a multi-award-winning, environmentally-conscious pet company that makes pet products using bamboo shards, rice husks, shredded plastic soda bottles and 100 per cent natural rubber. The London-based company, founded in 2009, has already gained listings with some of the US’s largest wholesalers, including Animal Supply Company, Pet Food Experts, Frontier Distributing and Rio Grande. Now they are launching a new raft of “green”, eco-friendly products on the US market, targeting the $60 billion US pet trade. Helping them reach some of the owners of America’s 170 million dog and cats, will be one of America’s best-known and best-connected distributors, Pet Product Innovations, (PPI), based in Chicago. Founded by serial entrepreneur David Levy, a 19-year veteran in the US pet industry and the man who created top pet supply firm Zeus & Company, PPI have been signed as Beco’s Master Distributor in the US. Beco’s Co-Founder, young British entrepreneur George Bramble (pictured above left and below, with Beco Pets’ worldwide bestseller the Beco Poop Bag), said: “Our product range covers all four main life activities of dogs and cats – ‘Fetch’, ‘Eat’, ‘Poop’ and ‘Sleep’, in other words, toys, bowls, poop bags and beds. “Our dog and cat bowls are made from bamboo fibres taken from off-cuts when chopsticks are made, and our Beco Beds contain stuffing made from recycled plastic soda bottles. We are also bringing to the US a new range of eco-friendly toys, including the brand new Beco Flyer, a flying disc dog toy that whizzes through the air to the delight of its canine catchers. Founder of Pet Product Innovations, David Levy (pictured top right) said: “I spotted British firm Beco Pets as a high-flyer when we agreed to act as their master distributor across the US. I was impressed by their unique offer, great style and green environmental credentials. “At first, I didn’t know whether our distributors and retailers were ready for what Beco Pets had to offer. I went with my instinct – I decided to bring Beco to the United States because what they offer is unique, has a great style, in look and feel – and that’s only the surface. One of the many US retailers now excited to be stocking Beco’s new range of products is Bentley’s Corner Barkery, a chain of seven fast-growing stores in the Chicago area. Bentley’s is a family-owned business focused on helping pets and their owners understand the value of healthy foods and wholesome treats. Bentley’s believe Beco Pets will prove popular in the US because of its eco-friendly brand and durable products. Bentley’s Corner Barkery Co-Founder Lisa Senafe, who recently appeared on CNBC’s ‘The Profit TV show after Bentley’s acquired a seven-store chain in Chicago, Pet Stuff, now employs 40 staff and began stocking Beco Pets products one year ago. Other US quality stores are bringing Beco in, according to another US pet industry entrepreneur, Marco Giannini, Founder/CEO of Protein For Pets, a company launched two years ago that now spans 14 stores employing 50 staff. “Making healthy, eco-friendly and affordable products should be the number one thing that pet stores are doing. There’s no reason why we can’t do that in the pet industry,” says Californian-born Giannini, who set up the US-wide eco-conscious pet supply company with his wife and business partner, Berenice. “Everything that Beco Pets makes is healthy, affordable and good for the planet. That’s exactly the kind of company we want to partner up with. I think it’s unusual for any company to be 100 good for the planet. Beco is unusual because they are uniquely positioned that every single one of their products is health conscious or eco-friendly, and they are affordable. Beco Pets is a young, fast-growing, award-winning British company based in London. They are focused on creating fun products that are good for the environment without compromising on quality, price or aesthetics. Beco Pets believe that ‘eco’ living doesn’t mean having to go without. They are working hard to deliver a range of innovative, affordable, and eco-friendly pet products that make sustainable purchasing easy for pet owners. The range at Beco Pets has been growing steadily since the company formed in 2009 and now includes products in all four areas of your pet’s life – Fetch, Eat, Poop and Sleep! Everybody will tell you that their products are the best, but the team at Beco Pets really believe that theirs are. Beco Pets take all their products from design concept, (all Beco products are designed in Great Britain), through to shop shelf, which means the team understand what their retailers and customers really want. They pride themselves on making affordable, non-toxic toys and accessories that work just as well as competitor lines and rarely cost any more. The company believes that the foundations of any great product are selecting the right materials, and wherever possible, they use natural, renewable or recycled materials, such as rice husks, bamboo, plastic bottles and recycled cardboard. Beco’s rubber range is all made from their environmentally friendly rubber, containing ethically sourced rice husk, which is a bi-product from rice farming. This means as well as being biodegradable, their rubber is BPA and Phylaphate free. Beco’s plant fibre plastic is mainly made of bamboo, which is one of the world’s most renewable sources. This makes the bowls 100 per cent biodegradable. The Beco plush toy range and Beco Beds are all stuffed entirely of recycled plastic bottles, making their stuffing extra soft! They even recycle their cardboard boxes in the warehouse into packaging for all their shipments. Beco Pets has also just been shortlisted as a “UK National Champion” for the prestigious European Business Awards, to be staged in Milan, Italy this summer. Founded by 19-year industry veteran David Levy, former owner of Zeus and Company Pet Supply Distributors Inc, Pet Product Innovations, LLC is based in Des Plaines, IL and focuses on bringing to market innovative pet products that better the lives of pets and their owners. From the award-winning Zen Clipper to the #1 selling paw cleaner in America, Paw Plunger, Pet Product Innovations, LLC is devoted to making a difference. Through the PPI partnership, Beco is engaged with a clutch of America’s key wholesalers, including Animal supply company, who distribute to the West Coast and Pet Food Experts, who cover the Mid West and East Coast. Beco are also linking up with leading regional wholesaler Frontier, who supply Michigan, Ohio and Indiana retailers. Beco Cat Bowl: These eco-friendly cat bowls are made from sustainable and biodegradable bamboo and rice husks! Dishwasher safe and ergonomically designed with a low rim – perfect for sensitive cat whiskers. Twenty-two petcare companies were honoured on Sunday 27 September 2015 at the PetQuip Awards Dinner & Party, which took place in the Ludlow Suite at the Telford International Centre, in association with PATS Telford. There was also a Lifetime Achievement Award for author, educator and animal welfare advocate Dr Roger Mugford. Now in its third year, the event was a sell-out, attracting an audience from across the pet trade sector to hear the winners and runners-up names announced for each of the eight award categories. The world’s dog owners are becoming radically more responsible about cleaning up after their pets – led by the example of the UK, according to a new survey published this week. 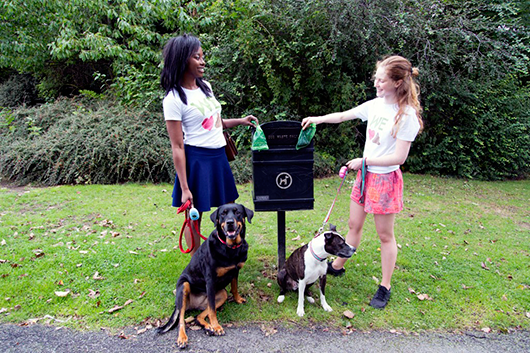 Britain’s top environmentally friendly pet product manufacturer, the award-winning south London firm Beco Pets, reports that worldwide sales of their degradable poop bags have soared by 800% in the last 12 months. In the UK alone, the rise in sales in the last year was an even more spectacular 1,400 per cent. Britain, followed closely by Spain and America, are the countries where dog owners are becoming increasingly responsible about clearing up their pets’ mess as attitudes change. This spring, in a separate international survey carried out by the company, French dog owners were revealed as being the worst offenders when it comes to cleaning up after their pooches, with pet owners preferring to leave the dirty work to others. Beco Pets, formed In 2009 by two young British entrepreneurs George Bramble and Toby Massey, is set to take centre-stage this weekend as a key exhibitor at PATS Telford. Co-Founder and sales director George Bramble said: “It is now widely regarded as something of a social taboo and to be deeply antisocial to leave dog mess around public places. And with this in mind we have launched ‘Project Poop Bag’.” (Campaign motto: ‘We love Poop’). Beco Pets pride themselves on their poop bags that have become one of their most successful exports. The bear-sized poop bags are bigger and stronger than other bags on the market and, better still, they are also more eco-friendly, as they fully degrade within one year when thrown away. All Beco Pets’ products are packaged in recycled cardboard and paper, and their poop bags are even eco to the core – they have a recycled cardboard inner core to roll the bags round, unlike competitor products that use plastic. The company’s bags have become the bag of choice for discerning UK pet owners and are now stocked in more than 600 independent retailers as well as nationwide by the UK’s largest pet supplies retailer, the High Street chain Pets at Home. Beco Pets has just been shortlisted as a “UK National Champion” in the prestigious European Business Awards to be held in June 2016. Co-Founder and design director Toby Massey added: “All our products are made from recycled, biodegradable materials and we encourage all dog owners to act responsibly when clearing up after their dogs. Among overseas delegates attending this weekend’s PATS trade show will be Beco Pets’ international guests, including distributors and retailers from countries such as Finland, The Netherlands, Belgium, Norway, the Czech Republic and Italy. All will be encouraged to spread the word on poop bags. The Spanish city of Tarragona is considering using DNA analysis technology to name and shame dog owners who fail to clear up dog mess. And the London borough of Barking and Dagenham was the first UK council to introduce dog poop DNA analysis this spring. Organisers of the 2015 PetQuip Awards yesterday paid tribute to Britain’s top eco pet product manufacturer Beco Pets, describing them as “a company whose eco credentials are loved by the world”. Beco scooped two separate PetQuip honours, a Gold Award for Marketing Project of the Year, and the second, a Silver Award in the Exporter of the Year category. The London-based company, which was formed just six years ago and which already exports to an impressive 43 countries, won Gold for its ‘Project Poop Bag’ campaign, helping dog owners to clean up after their pets. The Director General of PetQuip, Amanda Sizer Barrett MBE, said: “The number and quality of entries in all categories was of a really high standard” this year. She told the 200-strong audience at the awards dinner: “Gold is awarded to a company who came up with the idea of a welcome campaign to encourage dog owners to be more responsible in clearing up after their pets. “The campaign really is a winner. I’m sure everyone saw the company at the doors of the exhibition today [at the entrance to Telford’s International Centre], in eye-catching T-shirts, promoting Project Poop Bag. Reporting on this year’s judges’ deliberations, Manager of the PetQuip International Trade Association of Pet Equipment Suppliers Pat Flynn, who hosted the awards, also singled out Beco Pets in the Exporter of the Year category. Beco Pets’ team took to the stage to collect their awards and Co-Founder Toby Massey said: “We are really proud of our Beco Poop Bags marketing campaign. Beco are gave away one million FREE poop bags at PATS shows this year, and highlighted their ‘Project Poop Bag’ campaign by flying a giant green inflatable poop bag above their stand in Telford International Centre. Measuring 20ft by 8ft, the bag certainly caught the eye of passing trade … and visitors were relieved to hear it was just filled with helium gas – and not real poop. Sales of Beco Pets’ degradable poop bags have soared by 800% in the last 12 months. In the UK alone, the rise has been even more spectacular at 1,400%, a company spokesman said. Co-founder and sales director George Bramble said: “It is now widely regarded as something of a social taboo and to be deeply anti-social to leave dog mess around public places. And with this in mind, we have launched ‘Project Poop Bag’. He says the poop bags are bigger and stronger than other bags on the market and more eco-friendly, as they fully degrade within one year when thrown away. All Beco Pets’ products are packaged in recycled cardboard and paper, and the poop bags have a recycled cardboard inner core to roll the bags round. The bags are now stocked in more than 600 independent retailers as well as Pets at Home. Beco Pets, the leading manufacturer of eco-friendly pet products, has been named as a ‘National Champion’ for the UK in Europe’s top business awards. The company scooped the honour of being among just 54 shortlisted from among “thousands” of rival British firms who submitted entries for the highly respected and prestigious European Business Awards 2015/2016. Across Europe, 32,000 businesses from 33 countries applied to the awards, whose judges have previously included some of the world’s top business, economic and political leaders, such as Christine Lagarde (Managing Director of the International Monetary Fund), the former Prime Minister of Spain Jose Aznar, and the former EU Trade Commissioner Karel De Gucht. Beco Pets Co-Founders Toby Massey and George Bramble (pictured above L-R), said today they were “excited and very proud” to have been shortlisted for the finals, which are expected to take place in Milan, Italy, next summer. Beco Pets, which exports to 43 countries worldwide, is currently enjoying the most successful chapter in its six-year history, with UK and international sales booming. Co-Founder George Bramble (right) said today: “The quality and calibre of companies across Europe and the UK set the benchmark very high in the European Business Awards and we feel excited and very proud to have been awarded a UK National Champion status. Now in its ninth year, The European Business Awards are widely recognised as the showcase for Europe’s most dynamic companies. Beco Pets entered three categories for the awards, the Award for Environmental and Corporate Responsibility, the Award for companies with a turnover of Euros 0-£25m, and the Import Export Award. The next round requires National Champions to make a presentation video, telling their unique story and explaining their business success. Judges will view all of the National Champions’ videos, and award the best of this group the coveted ‘Ruban d’Honneur’ status. Ruban d’Honneur recipients will then go on to be part of the grand final in 2016. Last year, in the 2014/15 competition, all EU member markets were represented, plus Turkey, Norway, Switzerland, Serbia, Croatia and the Former Yugoslav Republic of Macedonia. Their combined revenue exceeded €1.5 trillion, and together they generated profits of over 60 billion Euros and employ over 2.5 million people. Six years after launching their company, Toby Massey and George Bramble are aiming to double its exports this year, moving into five new markets. In the US, their sales have experienced rapid growth after partnering with the world’s biggest distributor, Animal Supply. Beco markets include Denmark, Slovenia, Slovakia, Spain, New Zealand, Iceland, Austria, Lithuania, Latvia, Germany, Hong Kong, Taiwan, Portugal along with many others. Retail scalps include PETstock (Australia) Animates (NZ) Maxi Zoo (Italy), Stockmann (Finland), Woof Gang Bakery (US), Petland (Canada), Sagaflor (Germany) and Masque Pets SL t/a Kiwoko (Spain). The company recently launched their ‘Project Poop Bag’ campaign (Campaign motto: ‘We Love Poop!’), inviting independent pet retailers to register to become a Beco bag stockist. As one of the UK’s leading poop bag specialists, Beco Pets have sold a staggering 10 million bags to 15 countries around the world. With 8.5 million dogs in the UK, enterprising entrepreneurs Massey and Bramble seized a gap in the market for bigger, stronger and more eco-friendly poop bags. When did we become so rubbish at taking our dog mess home with us? Dogs may well be a man’s best friend, but the same cannot be said of the man who fails to clean up after his pet. Beco Pets, which exports to 43 countries worldwide, is based in Bellingham, south London and currently enjoying the most successful chapter in its six-year history, with UK and international sales booming. Beco Pets, Britain’s biggest manufacturer of eco-friendly pet products, has been named as a ‘National Champion’ for the UK in Europe’s top business awards. Plastic bags are a huge concern on a global scale and at Beco they were determined to do their bit to help. As things stand, approximately one million plastics bags are used every minute and each of these poo bags can take up to 1,000 years to degrade! Beco Bags make cleaning up after your pet as eco-friendly as possible. Commonly only 1 in 200 standard plastic bags is recycled, that’s a lot of bags going to landfill that will never break down. That is why Beco have developed the Beco Bag range. Unlike other bags, Beco Poo Bags are degradable and will break down after you dispose of them. Whilst they’re eco-friendly they’ve also been designed with function as a priority including anti-tear properties. These poop bags are extra large and very thick, so they cater for all sizes of poop and any nasty accidents are avoided! Size 22.5cm wide x 33cm deep. Beco Bag rolls also fit perfectly inside the Beco Pocket. Its always handy to be prepared so grab a multi pack! Each pack has 8 rolls of 15 of biodegradable bags, that’s 120 bags in total. Price is per PACK of 8 rolls. You can buy as many packs as you want. You are buying from a long established business. All our products are brand new and many carry full manufacturers guarantees. Check out our feedback. We have over 10,000 positive feedbacks many from happy repeat customers. Popular trade show, PATS Telford has sold its remaining exhibitor stands. Over 180 companies will showcase products and services at the event, which takes place on September 27-28 2015. A growing number of companies are choosing to showcase their products to retailers and overseas distributors at PATS. A number of international exhibitors are also using PATS as a platform to launch their products to the UK market. Parking is free at the Telford International Centre, and everyone will receive free tea and coffee, and a free show catalogue. To register for free entry to the show and to view the full list of exhibitors visit www.patshow.co.uk. When The BowWow Times got to link up with the UK’s biggest manufacturers of eco-friendly pet products and accessories, Beco Pets, they told us that from their offices in south-east London they now export to 43 countries. So we asked them what was the secret of their success, what makes their company tick – and are they just as crazy about dogs as we are? . .
Beco Pets, the British manufacturer of eco-friendly pet products and accessories, has become the first winner of a new award at the GIMA Awards 2015, representing the UK’s Garden Industry Manufacturers Association. The firm, based in Bellingham, won the PetQuip Export Achievement Award. Beco’s focus on building strong relationships with distributors, especially in the US, helped sales double in the last year. Exports made up 68 per cent of turnover, which also drew the attention of the GIMA adjudicating panel. The PetQuip association has revealed the final 41 names going forward to the judging process for the PetQuip Awards 2015. The judging is due to take place on September 8. Now in their third year, the PetQuip Awards are a popular addition to the pet industry calendar with places on the shortlist being hotly contested. PetQuip’s director general, Amanda Sizer Barrett (pictured above presenting Group55 with the Exporter of the Year gold) said: “Interest in the awards has made 2015 the busiest year yet and we are thrilled at the response from the pet industry. The winners, together with the recipient of the Lifetime Achievement Award, will be announced on September 27 at the PetQuip Awards Dinner & Party which is taking place in the Telford International Centre, Ludlow Suite, in association with PATS Telford. With over 100 retailers already booked to attend, the awards evening will provide an ideal opportunity for networking with colleagues, customers and industry bodies in a relaxed atmosphere, with ticket prices comparable to local restaurants making it an even more attractive proposition. Designed with dogs at heart ‘Beco Pets’ specialise in creating products that dogs will absolutely love, whilst ensuring that they protect our environment as much as possible. Where ever possible Beco use natural, renewable or recycled materials such as; rice husk, bamboo, plastic bottles and recycled cardboard to produce their eco-friendly products! Here at PetStay we offer a kind and loving alternative to kennels, we loved the idea of a range of dog products that offer kind and loving alternative for our earth, without the sacrifice of quality or range! ​Beco Pets offers its Beco Family For Cats. The toys are stuffed with recycled plastic bottles and filled with catnip to entice cats. They are double stitched for extra durability, and their softness makes them great for cuddling. There are three characters to choose from: Freddie the Fish, Bertie the Budgie and Millie the Mouse. Beco Pets has become the first-ever winner of a new award at the GIMA Awards 2015, representing the UK’s Garden Industry Manufacturers Association. The London-based firm, that sells its products to 43 countries around the world, won the PetQuip Export Achievement Award amid stiff competition from rivals, with judges saying they’d been “inundated” with entries. One of the biggest sellers for Beco Pets in garden trade stores across the UK are their eco-friendly Beco Poop Bags, which are extra-strong, anti-tear and fully degradable. Beco Pets’ success in selling their bags around the world contributed to their overseas sales figures that so impressed the judges. Beco’s focus on building strong relationships with distributors, especially in the US, helped sales double in the last year, exports making up 68 per cent of turnover, which also drew the attention of the GIMA adjudicating panel. Today, Beco Pets Co-Founder Toby Massey (pictured above, second left) said: “We are absolutely thrilled to have won the PetQuip Export Achievement Award. We continue to focus heavily on our international markets which are continuing to grow, and we’re fortunate to have great distribution partners worldwide who work tirelessly to build the Beco brand. GIMA said: “When it came to the export category, the judges were inundated with entries from both garden and pet suppliers, with pet supplier entries matching garden suppliers entry for entry. And GIMA Director, Vicky Nuttall, (pictured above, far left), added: “I would like to be the first to extend my congratulations to all of the winners. It’s been another tough year of judging, due to the incredibly high standard of entries. Before Jackman arrived my choice of toys was plenty. Once he arrived with his hard mouth, all my soft toys disappeared. See exhibit A. When Jackman gets his mouth on a soft toy it’s not long before it is in need of surgery with its stuffing spilling out. To rectify this our humans have resorted to finding the most durable of toys that Jackman would not destroy, but that we can both enjoy. One day our human mum came home with the Beco bone. The biggest problem. . . there was only one. We’ve had the bone for about 8 weeks and it is still in one piece. That’s not because we don’t play with it. The moment our humans pull it out of our toy basket we go bonkers for it. What makes it’s so great for us and our humans? Here are just a few reasons why we’re fans. When your customers are off on their holidays, we know that looking after their dog lovingly during the trip is a high priority. Now’s the time to stock Beco Pets’ unique Travel Bowl, produced by Britain’s biggest manufacturer of eco-friendly pet products and accessories. The bowls, made from silicone, come in three bright colours, green, pink and blue, and collapse completely flat – perfect for fitting in to a holiday suitcase. Whether they’re shopping for a Dachshund, Terrier or Corgi (small sized bowl), or for a Labrador, German Shepherd or Husky (large bowls), this item is perfect for dogs ‘on-the-go’. Holidaymakers travelling by car or plane, camping or hiking, love these bowls which are durable, non-toxic and flexible. They’re so bendable you can fold them up and put them in a large pocket or handbag. Pets need never miss a meal while outdoors. It’s important to keep dogs fully hydrated, and these bowl comes in handy for a quick drink stop. Small Beco Travel Bowl RRP – £5.99. Large Beco Travel Bowl RRP – £9.99. Hey there, wee Gazer! Happy Monday to you! If you’re feeling a little sluggish let’s kick off your week with a huge dose of entrepreneurial inspiration from George Bramble, co-founder of the award-winning, ‘green’ pet product and accessories company, Beco Pets. Stocking an impressive range of eco-friendly products for dogs, cats and other pets, Beco exports products to 43 countries worldwide and are the UK’s leading poop bag specialists, selling more than 10 million bags worldwide. And while poop bags may seem the stuff of giggles, with 8.5 million dogs in the UK alone, not to mention how much the Americans spend on their furry friends, George and his business partner, Toby, are a seriously enterprising pair. When George and his co-founder Toby Massey founded their business the timing wasn’t great, it was deep in the recession. So they asked themselves what do people not stop spending money on? The answer they came up with was children and pets, so this was where they decided to focus their business. Initially self-funded, George kept his job at Bacardi to support them while they set the company up. Although profitable from the end of the first year they knew they needed to scale, so they got a private investor on board who had made his money in clothes retailing and whose advice has been very useful. They used the investment to both launch more products and buy machinery and moulds for their in-house design and manufacture. The company has now grown to have 2 main areas of business: Beco Pets is present in 43 markets world-wide with 150 lines, and stocked by all the pet retailers in the UK, and their baby part of the business Becobabies is slightly smaller with 30 lines in 20 markets. Got an over-enthusiastic pooch on your hands? We’ve found you durable toys that will last more than five minutes. Play comes naturally to eco-friendly dog toy company Beco Pets and we love their Ball On Rope. Made from natural rubber and rice husk fibres, the ball is extra-strong and durable making it great for chewers. Used for a game of fetch, the rope handle will allow you to achieve extra throwing distance for your dog’s delight. Many people are now looking for eco-friendly products to use in their homes, recycling more and taking a bit more notice about what goes back into the environment. But when it comes to pet products can you do the same? At Beco Pets they make a range of tough, durable products that are also eco-friendly. This young yet fast growing company are focused on bringing you a selection of fun products that are good for the environment without compromising on quality. With their range of products growing steadily since 2009, they now deliver a range of affordable yet durable eco-friendly pet products that make it easier for owners to make sustainable purchases. Beco-Pet follow their designs through from concept to shop shelf, with an understanding of what pet owners want, and pride themselves on their range of non-toxic affordable toys and accessories that are a strong challenge on price to their competitors. Using natural, renewable and recyclable materials Beco Pets also work well to ensure that they maintain a responsible approach to their manufacturing. From beds to balls, food to fouling, Beco Pet have it covered with an extensive range of products that you can recycle again at end of use. Priced from £1.99 – £5.99 they are just as economically priced as their plastic or metal counterparts. Yet you can pop them on the compost heap without worry when they are done. Super Cool All Natural And Eco Friendly Dog Toys For Fun Without The Footprint! If you like dog toys and acessories that are as funky as they are functional, that are easy on the environment and that are non-toxic then look no further, Beco Pets will be right up your street! Beco Pets is a young, fast-growing, award-winning British company based in Bellingham, south-east London. They have been on the block since 2009 and grabbed attention from the get-go with their emphasis on creating fun products that are good for the environment without compromising on quality, price or aesthetics. They have also recently taken home an award at the GIMA Awards 2015, the Export Achievement Award, for their impressive expansion from a small boutique UK company to a global brand exporting to over 43 countries around the world. Beco Pets believe that ‘eco’ living doesn’t mean having to go without and that sustainable purchasing should be easy for pet owners. The range atBeco Pets has been growing steadily since the company formed and now includes products in all four areas of your pet’s life – Fetch, Eat, Poop and Sleep! What makes them eco friendly ? Beco’s rubber range is all made from their environmentally friendly rubber, containing ethically sourced rice husk, which is a bi-product from rice farming. This means as well as being biodegradable, their rubber contains no harmful toxins (it’s BPA and Phylaphate free). Their plant fibre plastic is also mainly made of bamboo, which is one of the world’s most renewable sources and 100 per cent biodegradable. On top of that their plush toy range and Beco Beds are all stuffed entirely of recycled plastic bottles, making their stuffing extra soft! They even recycle their cardboard boxes in the warehouse into packaging for all their shipments. Not surprisingly though, one of Beco’s biggest sellers are their eco-friendly Beco Poop Bags, which are extra-strong, anti-tear and fully degradable. These are definitely a firm walk time favourite among the doggy parents in the office here at the BowWow Times! Beco Pets had a big presence at PATS Sandown and it paid off hansomely for Britain’s biggest producer of eco-friendly pet products. The award-winning company, which exports its wares to 43 countries around the world, said they detected “a terrific atmosphere of opportunity” among delegates attending the show this year. One early highlight for Beco Pets came when their popular Beco Catnip Toys won a “Highly Commended” certificate in the show’s New Product Awards. Their other great success was their set-up in the main Surrey Hall’s Beco Buyers’ Lounge, which included an inflatable Beco house, a lavish garden with grass and trees, and an expansive adjacent area for visitors to relax at tables and enjoy complimentary beverages. “Our Beco Buyers’ Lounge proved a major attraction for visitors to the show and this was our best year yet. We’d definitely be up for doing it all again,” said an enthusiastic Toby Massey, Beco Pets’ co-founder, who led the design of the imaginative and colourful Beco enclosure. “We were giving away free Beco Poop Bags throughout the show and in just two days at Sandown we succeeded in signing up 150 new Beco Poop Bag stockists, which was a tremendous result for us. Fellow co-founder George Bramble added: “We thought this year’s show was really well attended, so we take our hats off to the organisers for doing such a great job and putting in so much hard work behind the scenes both before and during the two days. Selling coals to Newcastle may be the stuff of entrepreneurs’ dreams, but one British company has managed to master the art of selling chopsticks to China. The co-founder of Beco Pets had his “eureka” moment on a trip to China, after realising the potential of bamboo dust as a raw material for making eco-friendly pet products when he saw how much of it was left over in the country’s chopstick factories. The Italians do it, the British do it, but the French and Germans just can’t be bothered. Which country’s dog owners clear up after their pooch’s mess? They may have the best food, the chicest clothes and that certain je ne sais quoi, but it seems the French are a mucky lot when it comes to dog mess. French dog owners are the least likely to clean up after their dogs, turning their noses up at the very idea of stopping to gather up their pet’s doings, according to an international survey of dog owners’ habits. The findings were based on the number of poop bags sold in any one country by British-based pet products company, Beco Pets. The firm has sold more than 10 million of its Beco bags in 17 countries around the world since their launch in 2009. According to the survey, the most conscientious dog owners outside of the UK – where the company naturally has its strongest customer base – are the Italians, buying nearly 800,000 poop bags between them during a six-month period. Bottom of the list come the French, buying just 3,600 poop bags during the same period, and the Germans, having bought 4,300. Marginally better are the Russians – with 8,500 – and the Koreans, who bought 16,000 bags. Toby Massey, co-founder of Beco Pets, found that French dog owners expect their pet’s mess to be picked up by the country’s army of municipal street sweepers and are loathe to do so themselves. Mr Massey, who commissioned the survey, said: “One French customer recently said to us: ‘The French just do not pick up their dog poop.’ Apparently they think its just not their job to do it and expect council street cleaners to sweep it up after them. Mr Massey said the Italians’ fastidiousness may also be explained by the importance they place on cutting a ‘bella figura’ while walking their dogs. “They also seem to be quite eco-conscious and environmentally responsible and so are more likely to clean up the mess their dogs leave behind,” he added. Mr Massey founded the firm with his business partner George Bramble after the pair spotted a gap in the market for biodegradable and environmentally friendly poop bags. They now sell nearly four million bags a year in the UK, with 1.85 million lost in the six month period covered by the survey. Directly from the UK, the eco-friendly products coolest I’ve ever seen! The world is concerned about the environment, and products for pets could not be left out. With this reasoning, entrepreneurs George Bramble and Toby Massey created a totally “green” company, highly conceptual: the Alley Things. Founded in 2009, the same year won the UK Best Product Award for its Alley Bowl a feeder made of pressed bamboo fiber – chopsticks factories wastes, the Japanese chopsticks, told me George. The piece is super tough, 100% biodegradable, and a pioneer in the market. Since then, the company has been expanding its product mix in order to meet four basic needs of our pets: eat, play, sleep and poop! Today the line includes toys, beds, bags of poop and related accessories for dogs and cats. The company made its debut at the Global Pet Expo this year. The toy line is barbaric! With rubber toys, rope and pets, was fully designed for the fun and well-being of your pet without harming the environment. Rubber toys: made of natural rubber and rice hull fiber, highly resistant and non-toxic.Rubber is flavored with natural vanilla, which greatly aroused the interest of dogs. The balls and bones still has slots for snacks and are irregular, adding to the fun. Wind-up toys: the strings are produced with a mixture of cotton and hemp (hemp). The hemp fibers are short, which makes the toy more secure. If your pet eat the toy, the likelihood of accidents is lower – long fiber rope toys can cause bottlenecks in internal organs. In addition, all the fibers come from certified organic suppliers, and are pesticide free. Pets: the line is super fun because it was inspired by the people behind the company. For example, George is the giraffe, Toby is the bear, and so on! Both the outer fabric and the inner padding is made from recycled PET bottles – are reused 12-20 bottles in each toy! Cat toys – mouse, goldfish and bird – has filling catnip (cat grass) American best quality, very stimulating for pussies. The beds are made of cotton and hemp fiber on the outside, with padding of recycled PET bottles.Each bed consumes 30-90 pet claws, and everything is fully machine washable. Finally, the line of poop bags. In addition to being fully biodegradable – lead 6 to 12 months to completely degrade – are extra large and reinforced to facilitate the task of collecting caquinhas in general. There are even accessories – one dispenser that attaches to any tab, and for cats, litter pan and shovel. To the core of the roll of bags is made of biodegradable material, rather than plastic, as the majority. As creativity is a registered trademark of the company, some things are amazing. To wear the team during a fair in England, the creative developed a campaign based on the poop bags, declaring “We love poop” (we love poop). Thus, the team wore shirts with the slogan of the campaign and, of course, drew a lot of attention. And for anyone who is a fan of The Big Bang Theory, the brand’s products appeared on the show during an episode happened in a pet shop! It’s because? In addition to cool, the products are beautiful! The winners of the PATS Sandown 2015 New Product Awards were chosen by a team of expert pet retail judges and announced by show organiser Gordon Thomas at lunchtime on Tuesday 17th March. Their decisions, from more than 170 new products entered, took into account a number of guideline criteria such as product innovation, design, quality, packaging and value for money. The judges agreed that the New Product Showcase had produced a high calibre of entries with a tremendous amount of innovation. They were pleased to see such a wide range of products, and felt the majority of items on display were reasonably priced in today’s challenging economic times. Judges’ comments: This toy is a really innovative product. Cat owners will love the fact that the toy is good quality, durable and long lasting. It will definitely keep a cat entertained for hours while its owner is out and about. It’s a fun toy that fulfils a cat’s natural hunting instincts. One of the UK’s leading pet product companies is giving away one million poop bags free in a nationwide campaign to encourage British dog owners to be more responsible. Award-winning firm Beco Pets is launching the initiative at PATS Sandown next week (Tuesday and Wednesday), where it is hosting a reception in The Buyers’ Lounge throughout the trade show. Every one of the 2,000 delegates attending the two-day expo is welcome to visit the lounge, situated in the main Surrey Hall at Sandown Park, near Esher, Surrey. The Beco display area has been turned into a colourful Beco World, with a grassy garden, cut-out trees and an inflatable house. As well as a warm welcome, delegates will receive free refreshments and have an opportunity to sign up to Beco’s UK-wide ‘Project Poop Bag’ campaign (Campaign motto: ‘We Love Poop!’). Independent pet retailers can register to become a Beco bag stockist for FREE, no strings attached! Beco Pets are so confident that their eco-friendly poop bags are bigger, stronger and more eco-friendly than competitors’ that they have undergone a nationwide campaign giving stock away for free in an eye-catching countertop display on the basis that they believe the bags will sell well and the retailer will re-order. As one of the UK’s leading poop bag specialists, Beco Pets have sold a staggering 10 million bags to 15 countries around the world. With 8.5 million dogs in the UK, enterprising British entrepreneurs George Bramble and Toby Massey seized a gap in the market for bigger, stronger and more eco-friendly poop bags. The award-winning young duo formed the company in 2009, and are now rapidly expanding, exporting their extensive range of pet products to 43 countries worldwide. Based in Lewisham, south London, Beco have designed and manufactured more than 60 eco-friendly products for dogs, cats and other pets, including toys, feeding accessories, poop bags, hygiene products and pet beds. Famous for their Beco Bowls, which are made from the off-cuts of Chinese bamboo chopsticks, Beco Pets scored another international success with their luxurious extra-comfortable Beco Beds, which have proved a particular hit with British dog owners and their pets. Made from recycled bottles, Beco Beds are up to seven inches thick, making them arguably the comfiest dog beds on the market. The company believes dogs have better dreams on a Beco Bed. Also expected to catch the eye of stockists attending the show will be the new Beco Plush Toy range, being launched at PATS 2015. Every member of staff at this enterprising young British company has an animal named after them and the Plush Toy range features popular Beco characters such as Toby the Teddy, Aretha the Alligator, Lucy the Parrot and George the Giraffe, named after Co-Founder George Bramble. Made from recycled plastic bottles, the new Beco toy range is crammed with 10 bottles in every toy. Double-stitched for extra strength, and with a squeaker inside, Beco characters will provide hours of fun for discerning pets and their eco-conscious owners. All Beco Pets’ products are proudly designed in Great Britain. Award-winning firm Beco Pets launched the initiative at PATS Sandown today (Tuesday), where it is hosting a reception in The Buyers’ Lounge throughout the trade show. As one of the UK’s leading poop bag specialists, Beco Pets have sold a staggering 10 million bags to 15 countries around the world. With 8.5 million dogs in the UK, enterprising British entrepreneurs George Bramble and Toby Massey (pictured above right)seized a gap in the market for bigger, stronger and more eco-friendly poop bags. The opening day of PATS Sandown was hailed a success by exhibitors who unveiled an array of products to visitors at the Surrey venue. Many exhibitors were particularly pleased to see a growing number of international buyers visiting the show as well as UK-based retailers. The new Beco Buyers’ Lounge was busy all day and Beco Pets co-founder George Bramble said: “This year’s show has been a runaway success for us. We’ve been all hands to the pump. His co-founder, Toby Massey, was on hand to receive a highly commended award for Beco’s new recycled plastic catnip toys. Nathan Perry, key account manager of Pooch & Mutt, said this year’s show was the best yet. Ken Seymour, of The Tasty Bone Company, was pleased to welcome a high number of international visitors on to his stand, and said the quality of interest shown in the company’s product range, particularly the Tasty Twin Pack, was impressive. Ken Mackinnon, of K9 Dog Wash, said business was non-stop on his stand for the first three hours of the show. Aqueos was attending its second PATS Sandown and it proved well worthwhile as its Spray on Plaster won Best Pet Care Product. PATS Sandown is open today (Wednesday, March 18) until 4pm. The winners of the PATS Sandown 2015 New Product Awards were chosen by a team of expert pet retail judges today (Tuesday) from more than 170 new products entered. Their decisions took into account a number of criteria such as product innovation, design, quality, packaging and value for money. The judges agreed that the New Product Showcase – sponsored by pbwnews(petbusinessworld.co.uk) – had produced a high calibre of entries with a tremendous amount of innovation. They were pleased to see such a wide range of products, and felt the majority of items on display were reasonably priced in today’s challenging economic times. Winner: KONG Glide ’n Seek, entered by KONG. Judges’ comment: This toy is a really innovative product. Cat owners will love the fact that the toy is good quality, durable and long lasting. It will definitely keep a cat entertained for hours while its owner is out and about. It’s a fun toy that fulfils a cat’s natural hunting instincts. Highly commended: Beco Catnip Toys, Beco Pets. Award-winning firm Beco Pets is giving away one million poop bags in a nationwide campaign to encourage British dog owners to be more responsible. Beco Pets is launching the initiative at PATS Sandown 2015 (which opens tomorrow, March 17), where it is hosting a reception in The Buyers’ Lounge throughout the two-day trade show. A spokesman said that Beco Pets is so confident that its poop bags are bigger, stronger and more eco-friendly than competitors that it launched the Project Poop Bag campaign using eye-catching countertop displays, and is giving the bags away for free. Beco co-founder George Bramble said: “We started Project Poop Bag back in the Autumn and so far we have had nearly 300 retailers sign up to the campaign. The results have been fantastic, with more than 60% re-ordering within a month. All PATS visitors are welcome to visit the lounge, situated in the Surrey Hall at Sandown Park. The Beco display area has been turned into a colourful Beco World, with a grassy garden, cut-out trees and an inflatable house. Independent pet retailers can register to become a Beco bag stockist for free. Beco Pets has sold 10 million bags in 15 countries.